Dr Nico van Belzen is Director-General of the International Dairy Federation (IDF), Belgium. He has occupied senior roles in both industry and research organisations, both as Head of the Research and Analysis department at the ingredients division of Campina and as Executive Director of the European Branch of the International Life Sciences Institute (ILSI). In meeting rising demand, more intensive dairying systems face a range of challenges such as maintaining high standards of safety in the face of the continuing threat from zoonoses, whilst sustaining nutritional and sensory quality. At the same time farms need to become more efficient and sustainable. Finally, farming must also meet higher standards of animal health and welfare. Smallholder systems in developing countries face problems such as poor cattle nutrition, low productivity and vulnerability to disease which impact on safety, quality, sustainability and animal welfare. Drawing on an international range of expertise, this book reviews research addressing safety, quality and sustainability. Part 1 reviews pathogens affecting milk, their detection and control. The second part of the book discusses the environmental impact of dairy farming and ways it can be better managed, from improved nutrition to ways of protecting biodiversity. The book also reviews ways of supporting smallholders improve dairy farming in the developing world. Achieving sustainable production of milk Volume 2: Safety, quality and sustainability will be a standard reference for animal and dairy scientists in universities, government and other research centres and companies involved in milk production. It is accompanied by two further volumes which review milk composition, genetics and breeding as well as dairy herd management and welfare. "As demand for dairy products continues to grow, and with sustainable nutrition and food security at the top of the global agenda, it is imperative that we develop and share the latest knowledge, practices and issues relating to sustainability of dairy chains. With a veritable Who’s Who of dairy expertise and an expert editor in IDF Director General Nico van Belzen, Achieving sustainable production of milk will go a long way to achieving this." Dr Jeremy Hill, President - IDF/Chief Technology Officer - Fonterra Co-operative Group Ltd.
"…provides a deep insight into safety, quality and sustainability of milk production." 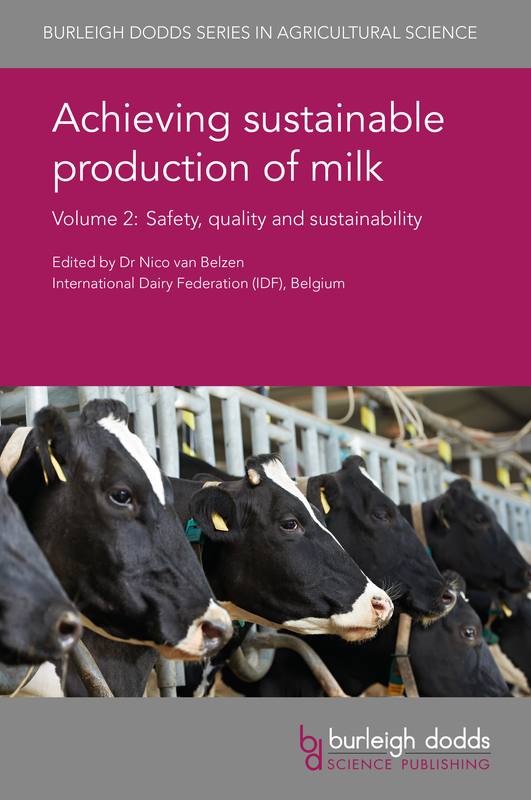 "Edited by the Director General of the International Dairy Federation, Dr Nico van Belzen, there can be little doubt regarding the scientific quality and likely impact of these volumes… I hope that the books/chapters will find a large audience and, by doing so, help to achieve the sustainability of milk production that the title promises"